Do we really need a town meeting to determine what sidewalks would be best along the Common? Since cost, safety, maintenance,and visual impact are such simple things to consider, can't we do that without a lot of hullabaloo? I like brick, but I don't like ongoing maintenance. I don't want to see folks tripping on bricks, although they will regardless of what a sidewalk is made of, and I like to save money most of all. Appearance is important, but by no means as important as safety , or cost, but still it often leads us in a particular direction. Is the sidewalk to the left real brick or stamped concrete? How about this sidewalk? 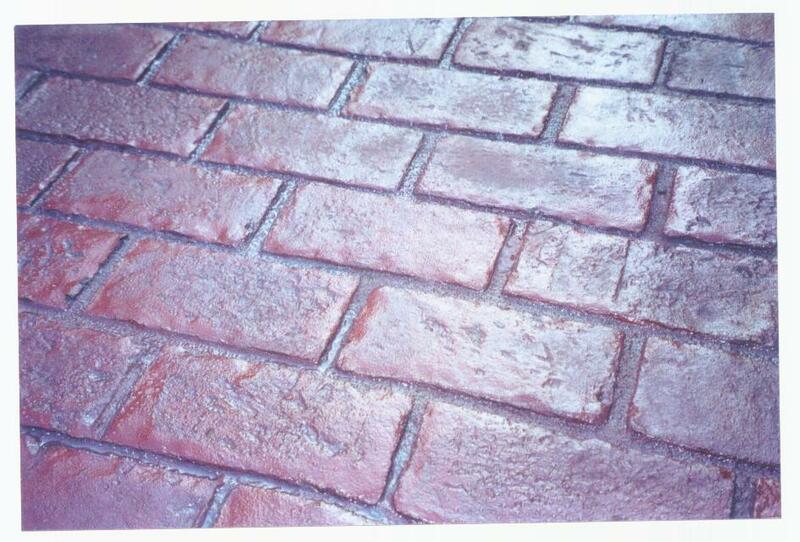 Real brick, or stamped concrete? Stamped concrete costs less than individual bricks for installation, and maintenance. 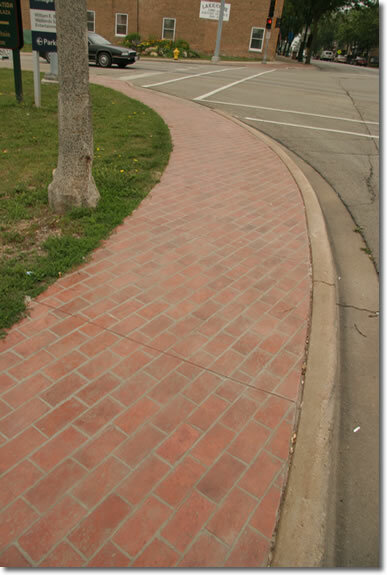 Both sidewalks look great, but which is brick, and which is stamped concrete? Obviously, these are real individuall bricks. Looks rather labor intensive doesn't it? It is. Translation: More money. Real brick, or stamped concrete? Just one of the many styles of actual brick, and stamped concrete. This has absolutely nothing to do with the other bricks, just a great album by Jethro Tull from 1972, but I think that some politicians are as the album title states. It is simple, we only have so much money to use to lay down sidewalks around the Common, yet we want the most cost effective, eye pleasing walkways that are also safe, and will not put the town on the hook for ongoing maintenance. This isn't rocket surgery. I think the Board of Selectmen can move on this "major" decision on their own, and not have the town spend an evening in their company at a Town Meeting. Just consider the above, and stay within the original budget. If they can't, well then we will need to stick to the generic, gray, concrete sidewalks, or we can talk a bit more, and that we can do that at a Town Meeting eventually. Note: The top two photographs, and the bottom photograph are all stamped concrete. The whole thing puts me in mind of the roof on the town hall. After the project was approved at one price, there was an: "Oh, but wouldn't it be nice to have a slate roof rather than the regular roof that was on the original plan? And, oh, yeah, it'll cost more money, but it's so worth it for the look." I'm not interested in the idea of these "little" changes in plans, that will cost a "little" more. My idea of "little" is not the same as that of someone else. It seems rather a child-like way for our governing folks to go about things. "Mom, Dad, I know you said you would pay for this, and I know you think it's expensive, but for just a little more it would be oh, so much better. Please, please, please? Other kids have this. Please, Please, Please?" To the brick sidewalk, and additional maintenance cost, I think the answer should be no. No more surprise extras for me in a town where we do very little about the cost of living for the salt of the earth people of modest means who have faithfully paid taxes and asked very little in return. Wow, that first commenter seems to have an axe to grind and it's sad that there is nothing positive in the comment. Fact is, there is a lot of stuff being done for salt of the earth people of modest means who faithfully pay taxes and ask very little in return. If you pop your head up and get involved instead of complaining about it, you will find there are tons of volunteers who use their extra time doing just what you have admonished them for, and it's short-sighted and inconsiderate of you to pick on such "regular folk." It doesn't HAVE to be brick but brick layed in concrete would be nice looking, dress up the common nicely, and yes, it's safe and requires little maintenance; there are those of us who are salt of the earth, pay taxes, and ask for nothing who want brick. I can appreciate what the brick will look like around the town common. I'm glad such things are being considered by selectmen with fresh ideas and fresh blood, instead of living by the same old, same old "it costs too much" mentality. Frankly, I'm tired of living in a town that has been run by people who don't like change and are afraid to take risks. I want brick; many people I know want brick; I'm willing to pay my part for the brick if need be because it's a way to beautify the town. GO BRICK! It is interesting no one has complained about that massive stone wall along 131. That could have been made from cement and save plenty of $$$$ to pay for the brick sidewalk. The gigantic stone wall serves no one but drivers who should have their eyes on the road and will never appreciate the stone work. Anonymous, Of course there are many volunteers who do wonderful things in Sturbridge, but there you go again. I volunteered and did "wonderful things" for Sturbridge, too, for many, many years, and still do what I can for others, so you can stop accusing me of being a lazy no account. My family has also done "wonderful things" for Sturbridge, and has a long, long history of doing so. This "town," government, as a whole, does very little as far as affordable housing etc., except for that one lonely Housing for Humanity house project that is taking forever. We take in money that can be used for affordable housing, and other things, but it seems that the large portions of what could be spent are "weighted" toward keeping this a "quaint little town," the elite like to call home. Some people would gladly give their poor "neighbors," a cup of soup, but would think nothing of doing whatever they could to keep them and others like them under their, shall we say "guidance." Anonymous said..."Frankly, I'm tired of living in a town that has been run by people who don't like change and are afraid to take risks. I want brick; many people I know want brick; I'm willing to pay my part for the brick if need be because it's a way to beautify the town. GO BRICK!" Yada, Yada. Well, I don't want brick! If we truly had $175,000 or more with which to "take risks," which we don't, I would much rather see it go toward a full college scholarship, or lots of small ones, an affordable housing effort other than just the one Habitat House which is taking years to accomplish (and at considerable cost beyond the "freebies"), lowering taxes for people in a real pinch, etc.etc. Many people too work hard to put their kids through school, pay their medical bills, pay for insurance, pay their taxes, buy food, drive a car, and do things for others with their own private funds to even think about spending extra for what is already a nice town common area. We already have the "harbor lights" of attraction here in Sturbridge. Now let's concentrate on truly being the welcoming home port for our families. Regular Folk seems to have a laundry list of dissatisfaction. How sad. I suggest that you talk with the Housing Parternship if you're dissatisfied with the one lonely housing project - do you have any idea how much time and effort went into pulling that together? Apparently not, because once again you have belittled volunteers and diminished the work of those who spent countless HOURS working on it. Take your complaint to the Housing Partnership Committee - I believe Charlie Blanchard is the man you want to talk to and therein lies the problem. The people who live in Sturbridge are not elite; where on earth does that kind of thinking come from? My opinion is, if you think others are elite, then you have issues and perhaps consider yourself less than others. Maybe you need help? I spent today in Boston. The new Harbor Walkway is just outstanding and guess what? It's made of all brick! THOUSANDS of people walk there and it's absolutely beautiful. I watched what people were wearing on their feet: one woman was wearing spike heels and she was walking just fine on the brick. Most people were wearing sneakers, like me, and in the 6.5 hours I spent in the city, I saw not one person trip, slip, or anything of the sort. After we left the Harbor Walk, we ended up on the gray sidewalks - how boorish and how out of place in that beautiful city. But what I find completely ridiculous is that Scott Garieri was quoted in the Southbridge Evening News as saying he did an informal poll, asking people if they would come to Sturbridge if there were brick walks...my first thought was how unintelligent a question it is - no wonder people looked at him funny. First of all, that's the most he's done for this town since elected. Seondly, for someone who is supposed to be so "pro-business" he is basically shooting down the Publick House's offer of paying $25,000 toward those sidewalks and PH will even maintain them. After visiting Boston today, I am even more convinced that brick is definitely the way to go! I spent the day in Sturbridge. I like it here, much better than Boston and hope that everyone who enjoys living here will be able to afford to stay. I don't give a hoot what the "Jones" have that some may consider better than what we have. Have you noticed that the entrance to Haynes St. is even more narrow than it was before any type of sidewalk construction began? Trucks will run over the curb (and new sidewalk) more than ever now, even if it is concrete in that particular location.I also am not bothered by Charlie's politics or Scott's survey. I am bothered by the fact that so much money is spent to beautify the town and to buy up land and not left in the coffers to use for things which are really important. Also there are many ways of volunteering and they do not all require spending money. It's great that we have so many volunteers, it's not great that so much money is spent unnecessarily. RE: Anonymous said, "once again you have belittled volunteers and diminished the work of those who spent countless HOURS working on it." Not true! No one belittled the volunteers. Saying that there is one lonely Habitat project for affordable housing is not being critical of volunteers. Someone simply stated that they do not agree with spending money for brick sidewalks, and that IF moneys were available, they would be better spent elsewhere, where they could do more good. To Regular Folk. You have your facts wrong, in reality the slate roof was specified to be repaired or replaced for Town Hall and Center School during reconstruction. When trouble arose in the basement of Town Hall more money was needed for stabilizing Town Hall. The building committee was forced to look for areas to save money and did a change order which specified asphalt shingles for Town Hall. Many people did not like the idea of asphalt shingles so a solution was sought. The Community Preservation Committee supported an article which was brought to the Town Meeting floor and the voters resoundingly supported using CPA funds for the purpose of slate roof on Town Hall. It seems people care about what our historic town common looks like. Sure some people might drive by and not care that the buildings are beautiful, these same people may have wanted Town Hall to be moved to the All Star building or the empty Ames space. Aesthetics are a matter of opinion and there are many people who agree with the Board of Selectmen's vote and think that brick sidewalks on our Town Common area are more attractive and will enhance the area. If we all lived life by the principles that are brought up by the negative people posting here, we'd live in one unattractive world. I'm sure the negative posters will come back to tell me that I'm an elitist. By way of criticizing the 'one lonely Habitat project', you have critized the volunteers who worked on it. It's shabby treatment regardless of how you may try to spin it. The whole approach to this concept of brick sidewalks by some commenters here is boiling down to one thing: bitterness over past votes by the majority of residents over things like restoring town hall and center school and costs involved in doing so. To some, those restorations are a waste of money. It's a different point of view that isn't worth arguing over because some people just do not see the value in saving old buildings, or see the need for a sense of place that towns need to vie for to attract visitors and businesses. 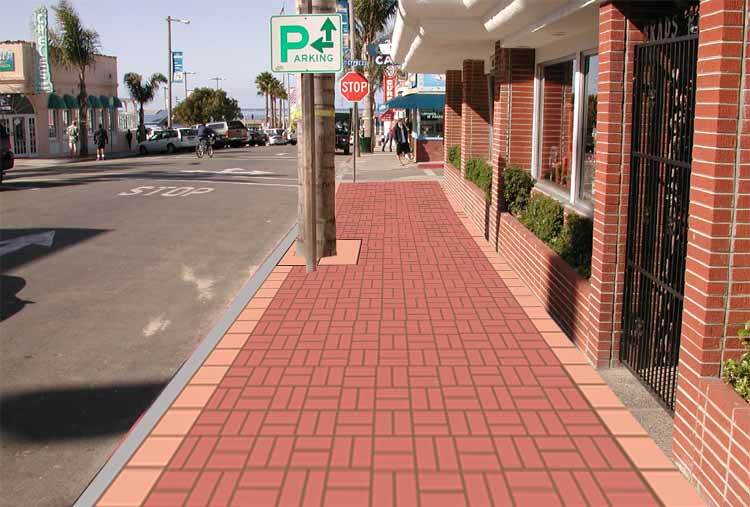 Many other towns and cities would not spend money on brick sidewalks if it was a waste; beautiful places bring people and business to their towns and cities. The sidewalks ADD TO the sense of place, and beauty, much like the architecture and history of Sturbridge's Center School, Town Hall, Library, Publick House and Town Common; that grouping creates a sense of place for Sturbridge. I liken those commenters who are opposed to brick sidewalks, to those residents who USE Old Sturbridge Village all the time for FREE but never buy a membership to support their work. It's that same narrow mentality that sees spending money on bricks as a waste; just the same as supporting your local museum which brings thousands of dollars and visitors into the community seems to be a waste. It's worth mentioning that the other business in town that also attacts thousands of visitors, namely, the Publick House, wants these brick sidewalks and is willing to pay for and maintain them. Consider that if you spread out the cost of >$180,000 over all the taxpayers in Sturbridge, the cost is negligible. So what is this really about? I hope this issue does go to town meeting because I believe and hope it will resoundingly pass with the majority of voters. People who are opposed to this are looking for an immediate return on their money. Rather, brick sidewalks are an investment the community just like the renovations to our most prominent buildings in town are an investment. Over-doing the a picture perfect look looks "plastic." It looks looks plastic and unreal in buildings, etc., just as it does on people. We are real people in a real world and have real needs. Beauty is in the eye of the beholder, and in the heart of those who see beyond what the eyes behold. Too often plans are made, and then changes made to those plans for some reason, and then more changes to go back to the original plan. Slate roof is a good example, but was for a reason. I remember when the plans were in the paper about the sidewalks on 131 there was mention of the brick sidewalks around the common. No fuss back then. Now there is? Why? It was in the original plan. Wasn't it? Things do happen, we all realize that, but when additional expenses come up, and must be dealt with, please don't expect more $$ to bring plans back to square one. Plans need to change, and accommodate the unforeseen. Everyone is missing the biggest thing: we are going to finally have sidewalks on the rest of Main Street!! We are finally entering the 1950's!!! Now, all we need to are traffic lights at the dangerous intersections, more crosswalks, and better lighting. Not enough street lights in some places, and too many where they are not needed. What we need is a plan. Don't tell me about the Master Plan, that is only for decoration, like the one 25 years ago, we need a real plan. Right on! Some of us seem to keep on keeping on in seemingly being a little too interested in spending everyone's money with a great emphasis on "decorations." How many people even knew that the old roof on the town hall was slate, and how many look at the roof now and say, "Oh, my! We need to visit Sturbridge again soon because they have a slate roof on the town hall"? Many tourists who visit OSV also visit the Publick House, and even a greater number of tourists don't even know where the center of town is located. We have two Main Streets. Signage cost less than a "brick" sidewalk. Oops, now there's that naughty word again (signage). Lighting is another bad word, interior lighting, that is. Now lighting that just aims at a sign (or an individual letter!) to enlighten it from the outside is considered to be a good thing. In many cases it is, but when it's near a highway and not placed correctly it can blind divers, and one sign located down by OSV blinded me a few years ago. Yes, I know, there's someone reading this who will just ask if I complained about the light. The point is that had there been an accident it would have been already too late. We need to think through what we are doing and not be so "blinded" by all the decorating ideas. When our roof leaks, we need a roof, no matter what it's made of. It would be nice to get the driveway paved, too, but we spend thoughtfully and some things are just more important than others. We live within our means. As far as spending extra for bricks or slate, or floors that require "special" maintenance, let's start to really think and not just "thimk." Some people want an immediate return when spending money. 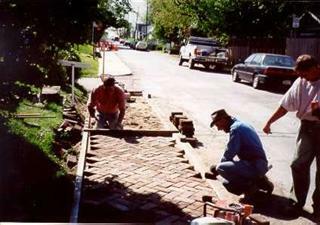 Brick sidewalks are an investment in the community, they will last for years to come, and they will require little mainteance. Oh, puleeze! We have been spending money hand over fist. Enough is enough. Folks are making choices between food and medicine. Let's not raise their taxes for something nobody needs!